I'm Strataman, and if this is your first visit to my website then Welcome but if you are returning for a followup visit, Welcome back. Strata Title is a very complex and challenging area. It's filled with so much legal terminology and jargon that even lawyers, at times, have difficulty interpreting all the legislation, by-laws and guidelines associated with it. What chance then does the average person in the street have of understanding it all? My purpose, with the help of the information on this site, is to assist ordinary folks gain a better understanding of what Strata Title and, in particular, what Strata Management is all about. This website was specifically created to be a simple guide on Strata for everyone.....for the owners and tenants of strata properties, for those considering investing in a Strata Scheme, for those currently managing a Strata Scheme, for those currently working in or affected by this industry or for those who would simply like to learn more about the subject. It's primary purpose is to act as a sort of central information portal for those needing strata title information. Of course, every situation is different and strata can be a veritable minefield of legal complexities. Even within Australia the laws regarding Strata Title vary from state to state and so, for the time being, I'll be focusing primarily on New South Wales (NSW) legislation. And, within the Strata structure itself, there can be different strata types like Community Schemes and Neighbourhood Schemes, Strata Schemes, Retirement Villages, Caravan Parks, Tourist Resorts and Hotels and so on. Again, for the time being, I'll be mainly focusing on Strata Schemes with a small section available on Community Schemes & Neighbourhood Schemes as this is the next largest group. DISCLAIMER: Please bear in mind that any information provided by this website is intended as a general guide only. It should never be substituted for professional legal, investment or taxation advice, which should always be obtained before taking any action. Please make sure you read the disclaimers at the bottom of every page on this website to become familiar with all this legal stuff. Keep an eye out for the information links (which look like this link to the left) spread throughout the many pages - actually, there's some a few paragraphs down and one a few paragraphs back. Some of these links will take you to another part of this website while others will take you to an external website but both are there to assist you understand or learn more about the particular item being discussed or described. I've tried hard to focus on the main areas of strata that almost everybody has to know about at sometime or other in their strata 'life'. I've also attempted to keep it fairly light hearted with not too much "legalese" which can tend to confuse most people - including myself. The topics I've covered are by no means exhaustive and I fully expect to add to this list as time goes on but, for now, have a good look at the menu items on the left side of this page. I'm sure you'll find something of interest to keep you busy...and maybe even amused. For those of you out there who like to get into the 'details', there's also many links to the actual Legislation for the Strata Schemes Management Act 2015 and Strata Schemes Management Regulation 2016 which should keep you busy for hours and hours - so happy reading! I've also included sections on Frequently Asked Questions AND the latest Strata Law Reforms as well as a section containing some other Helpful Websites AND a commonly-used Strata terms and industry jargon section. 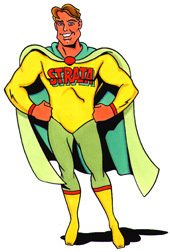 So, if you come across a 'strata' word or two you don't understand, simply jump over to the Strata Terms and Jargon Information page and see if it's there. Most pages will have a link to the Strata Terms and Jargon information page - usually towards the bottom of the page. If you're involved with looking after a medium-to-large Strata Scheme, you would do well to seek the assistance of a licensed, professional Strata Managing Agent - also commonly known as a Strata Manager. Once you understand exactly what's required to look after one of these 'not-so-small' schemes you'll be thankful they're there to help. Just keeping up with all the legislative changes and compliance requirements, not to mention understanding how any changes will impact your scheme, can be a full-time job on its own. And that's only ONE small part of what needs to be done. However, for those involved in smallish sized schemes (usually consisting of around 5 lots or less) and wanting to 'go it alone', there's assistance available. But take heed of this warning as Strata Management, without the help of a professionally trained expert, is NOT an easy job by any means and definitely NOT for those who can't put in the on-going time and effort and learning required to make it work properly. Read my information page on Do-It-Yourself Strata Management to learn all you need to know on this topic. But remember - the full responsibility for the running and maintaining of the scheme as well as keeping up with all legislative, compliance and tax law changes falls squarely on YOU if you go it alone. Only with your help can I make (and keep) this website something of use to you so please give me your feedback (via an email) when you can. I will welcome any ideas from you as to how I might improve this site to make it much more useful. Tell me what you like, what you don't like, what's missing and what needs to go. Help me to help you! Don't forget to tell your friends and colleagues about it too....so, go forth and spread the word!! I'll be regularly adding new information and updating what's there, so add www.strataman.com.au to your "favourites" or bookmark this page and come back often. Until our next meeting, thanks for calling by and good luck with your strata plan!